STORRS – The University of Connecticut has reached its highest rank of all-time among public universities, placing 18th in this year’s U.S. News & World Report list and marking seven straight years in the top 25. The list came out Tuesday and puts UConn next to other top schools such as the University of Texas-Austin, University of Washington and Purdue. UConn spokeswoman Stephanie Reitz tells WHUS News that she credits the student body for the school’s recent success. The rankings are based on criteria such as retention and graduation rates as well reputation among other institutions and guidance counselors. UConn has steadily boosted its ranking since 2000 when it was 38th among public universities. It then wavered between 19th and 21st place for the past six years until now cracking 18th. Reitz says that UConn’s ability to keep its students enrolled sets it apart from some other public universities. UConn retained an average 93% of students after freshman year between fall 2012 and fall 2015, which is the U.S. News rankings’ time window. Reitz tells WHUS News that the academic strength of UConn’s recent freshman classes has also boosted the school’s prestige. This year’s newcomers at Storrs have more valedictorians and salutatorians than last year’s – 161 to 157 – and more students in the top 10% of their class – 54% to 50%. The Storrs campus has received more applications as well – a record-breaking 35,000 this year; however, the 2017 freshman class is slightly smaller than last year’s – 3,650 to 3,800 – because UConn has received less state funding, Reitz says. She says graduation rates are also “very strong,” as the average Husky graduates in 4.2 years, the third-fastest among 58 public research universities. 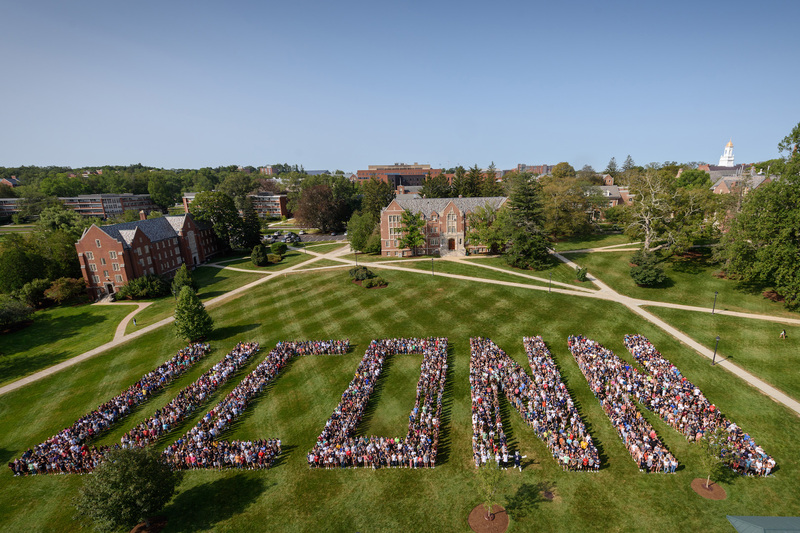 The 3,650 students from the UConn Storrs class of 2021 gather on the Great Lawn for their class photo. The class had a record-breaking 35,000 applicants. — Aug. 26, 2017. Reitz says that while the administration is excited about the rankings, its broader hope is that people outside of UConn become familiar with the university and think about applying. UConn is one of 1,389 national public and private universities ranked as part of this year’s U.S. News survey. Find the survey here.